The PKI 5705 consists of 3 different camera systems and can be additionally combined with an IR laser system. Moreover, it offers very fast setup possibilities as all components including control unit with monitor are housed in portable cases. The system consists of a thermal day colour (200 m) and a night vision (200 m) camera. The system is selected and controlled remotely by the operator from a simple user friendly control box which also operates the pan/tilt head. The instantly selected camera video picture is displayed remotely on a rugged waterproof 6.4″ high-resolution TFT LCD monitor with removable sunshade. Autonomous power is supplied from a rechargeable battery pack or from any 12V DC supply. 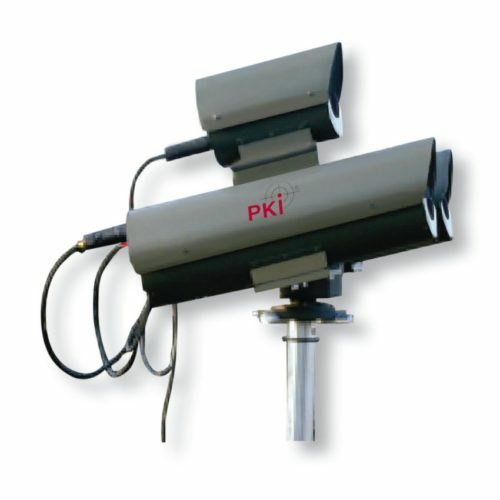 The PKI 5705 can be used for observations irrespective of the weather, both day and night and this in a range of up to 1000 m. Should larger operating ranges of 5 km or even 10 km be desired, this is of course possible with larger lenses delivered by us; the price, however, increases disproportionately.